VIEWING: Strictly by appointment with the Agents’ Paddock Wood Office on 01892 832325. No viewing will be permitted on the first floor of the Oast. DIRECTIONS: The postcode of the property is TN12 8HQ. From Paddock Wood railway station, head out of the village on Church Road. At the staggered crossroads at the Elm Tree Public House proceed straight across and follow Pearsons Green Road and Churn Lane through to the T Junction with the Maidstone Road. Turn left and Bassetts Farm will be found after a short distance on the left hand side. SITUATION: The buildings at Bassetts Farm are located in a former agricultural yard in a small hamlet of mainly residential buildings on the northern outskirts of the Parish of Horsmonden in the Weald of Kent. The well serviced town of Paddock Wood is some 3.9 miles to the west with its excellent shopping facilities and fast mainline railway connections to Central London stations in about an hour. Tunbridge Wells with its more extensive amenities is approximately 10 miles to the west with its road connections via the A21 to the M25 national motorway network to the north. There is an excellent choice of state and private schools locally. LOCAL AUTHORITY: Tunbridge Wells Borough Council, Planning Services, Town Hall, Tunbridge Wells, Kent TN1 1RS. Telephone 01892 554604. Email buildingcontrol@tunbridgewells.gov.uk. DESCRIPTION: The former Oast House and Hop Picking Machine Shed are a pair of redundant agricultural buildings in a yard setting at Bassetts Farm. The buildings have an approved Change of Use for Conversion to dwellings and the demolition of some redundant buildings. The individual properties are described below. A former Oast House building of concrete portal frame construction with part brick elevations which has consent to convert to a two storey dwelling presenting 4 bedroom accommodation. The total developable floor area (scaled from the approved plans) is approximately 4,886 ft2 (454 sq2). As part of the planning approval a section of the frontage of the building is to be demolished. First Floor: Landing with 4 bedrooms, one with en-suite facilities and a family bathroom. Store room. The Oast House sits central to a garden plot which wraps around the property on three sides. First Floor: Landing with 4 bedrooms two with en-suite facilities and a family bathroom. Outside: The building is located on the northern extremity of its plot with no rear garden but there is a good size garden to the front of the unit. NOTES: As part of the planning approval the building located on the boundary of Units A and B is to be removed, this is shown hatched green on the sale plan. This will be the responsibility of the purchaser of Unit A to carry out within one month of completion leaving the site clear to ground level. Two further sections of the buildings are to be removed by the buyers of Lots 1 and 2 shown coloured pink on the sale plan. The consent grants change of use for three buildings and Units A and B are being offered for sale and Unit C located to the west of Unit A is being retained to be developed by the Vendor. SERVICES: New electricity and water connections will be required to each unit. Appropriate easements will be granted to purchasers over adjacent property in the vendor’s ownership to connect. Purchasers should rely on their own enquiries as to availability of services. Drainage will be to one site private systems to be installed. PLANNING: Both buildings benefit from a Change of Use from the Storage of Catering Equipment (B8) to Dwellings (and the demolition of redundant buildings). Approval was granted by Tunbridge Wells Borough Council on 15th September 2017 planning reference 17/02448/FULL. The vendor has dealt with Conditions 3, 6, 8, 9 and 13 attaching to the original Planning Decision Notice and approval has been granted by Tunbridge Wells Borough Council on 20th September 2018 reference 18/01544/SUV. NOTE: Prospective purchasers should note the following. 1. 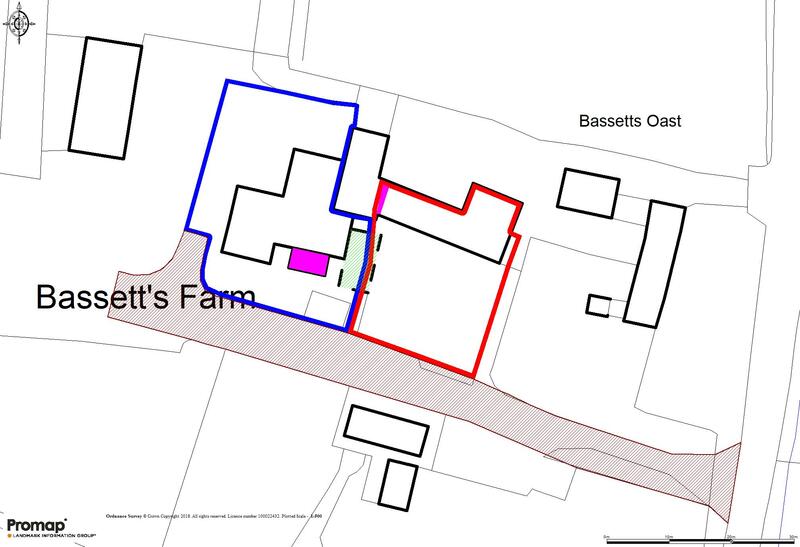 The purchasers will be granted a right of way over the driveway from the Maidstone Road shown hatched brown on the sale plan attached subject to a contribution towards future maintenance and repair. 2. If sold separately, Unit A and B would both benefit from a reflective covenant restricting the use of the properties within their defined curtilages to residential dwellings and uses ancillary to residential use. Should any mobile home be placed on either property during the course of conversion, they would be required to be removed on first occupation of the barns or expiry of the current Planning Consent. 3. If sold separately the purchaser of Lot 2 (Unit B) will be responsible for erecting and thereafter maintaining new boundary fences between Lots 1 and 2 within one month of completion. PLANNING: Copies of the planning drawings are available to be downloaded from our webside www.lambertandfoster.co.uk or can be sent on request. PARTICULARS, PLANS AND SCHEDULES: The particulars and acreages stated therein, together with the plans are believed but not guaranteed to be correct. They are given by the Agents to assist viewers but are specifically excluded from any contract and prospective purchasers must satisfy themselves as to the information contained therein. Anti Money Laundering Compliance (AML): The Money Laundering, Terrorist Financing and Transfer of Funds (Information of the Payer) Regulations 2017 came into force on 26 June 2017. This now requires us to conduct due diligence on property purchasers. Once their offer has been accepted, the prospective purchaser(s) will need to provide, as a minimum, proof of identity and residence and proof of funds for the purchase, before the transaction can proceed. Further information can be obtained via the following link: https://www.gov.uk/guidance/money-laundering-regulations-yourresponsibilities.